EXECUTIVE SUMMARY: Lockheed Martin recently registered a patent on a revolutionary design of a Compact Fusion Reactor (CFR), a mobile device small enough to be mounted on a truck. One version is designed to produce 100 megawatts, enough to power a city of 100,000 people. The CFR, which provides clean energy without producing radioactive waste, has both civil and military applications. In principle, it can be installed on large aircraft carriers, submarines, large transport planes, and probably also fighter jets and large drones. If Lockheed Martin’s hopes are realized, the fear of global energy scarcity will become a thing of the past, and mankind will have the benefit of an environment unsullied by energy pollution. On February 15, Lockheed Martin, the American advanced technologies consortium, obtained a patent on a revolutionary design for a Compact Fusion Reactor (CFR), a mobile device that can be mounted on trucks as well as aircrafts and ships. Development of the CFR started in 2010 in Palmdale, California. Apparently the project is advancing faster than expected, since at that time, Dr. Thomas McGuire, the project’s head, declared that the goal was to have a working device in five years and a commercial production reactor design within ten. Two CFR prototypes were introduced by Lockheed Martin on December 25, 2017. The first is the T4B, which is two meters long, one meter in diameter, and about 20 tons in weight. The T4B can produce one megawatt of energy. The second prototype, the TX, is 18 meters long, seven meters in diameter, and about 2,000 tons in weight. The TX can produce 200 megawatts of energy. However, Lockheed Martin believes the TX’s weight can be reduced to 200 tons. Fusion is a thermonuclear process in which the nuclei of hydrogen atoms join together and release a vast quantity of energy. The sun is essentially a very powerful thermonuclear reactor in which fusion reactions occur due to extremely high temperature and pressure conditions induced on the hydrogen nuclei – conditions that overcome electrostatic repulsion between the protons inside those nuclei. On earth, artificial fusion is possible only between deuterium and tritium, the heavier isotopes of hydrogen (D-T fusion). Deuterium, whose nucleus contains one proton and one neutron, is quite abundant on earth – it is found in one out of every 6,700 hydrogen atoms in water, and is radioactively stable. However, tritium, whose nucleus contains one proton and two neutrons, is radioactive, with a half-life of 12.3 years. There is no natural tritium to be found on earth, but it can be produced by irradiating lithium with neutrons (tritium breeding). Mankind succeeded in harnessing nuclear fusion for destructive purposes when it developed a thermonuclear weapon, also called a hydrogen bomb. Hydrogen bombs can be hundreds or even thousands of times more powerful than nuclear fission bombs like those dropped on Japan in WWII, since the energy released by fusion is infinitely more vast than in fission of heavy nuclei like uranium and plutonium. In addition to the scale of power released by fusion, this process has advantages over fission as a source of energy production. First, it is easy to distill deuterium from the inexhaustible amount of seawater – unlike the uranium needed for fission, which is less abundant and the extraction of which is complex. Also, lithium metal is relatively abundant in earth and in seawater. Lastly, helium, which is produced during fusion, is not radioactive, in contrast to the radioactive waste produced during nuclear fission. Nuclear waste has a long lifespan and requires special operations for its management, disposal, and burial. There was a swift transition from the use of nuclear fission to produce devastating weapons during WWII to its use for civilian applications. In the first half of the 1950s, nuclear fission was being used in electrical reactors. However, the shift from military to civilian use was much slower for fusion. Though the first test of an explosive thermonuclear device by the US was conducted on November 1, 1952, the effort to harness fusion for development of an electricity-producing thermonuclear reactor has not borne fruit – until now. This was not for lack of trying. For years, billions were invested around the world in studies attempting to enable the controlled release of thermonuclear energy. The motivation to implement nuclear fusion in electricity production stemmed not only from the tremendous amount of energy that can be produced in the fusion process, but also from the fact that that energy would be clean, without any of the by-products of long-lived radioactive waste. This field started in the 1950s with Soviet physicists Igor Tamm and Andrei Sakharov, who invented a toroidal-shaped thermonuclear device called the Tokamak. The device is a three-dimensional concentric ring containing very hot plasma of deuterium and tritium nuclei confined by powerful magnetic fields. The first Tokamak became operational in 1958, but it has not yet matured to technological and commercial feasibility. The prototypes of commercial Tokamak reactors developed in the Western world, particularly in the US, either produced less energy than they needed to heat the plasma to the desired temperature, or suffered from instability problems. They have all failed to live up to expectations despite huge investments. The JET (Joint European Torus), built in Britain, cost half a billion dollars through the end of 2014. The TFTR (Tokamak Fusion Test Reactor), built in the US, cost an unknown number of billions of dollars. The ITER (International Thermonuclear Experimental Reactor), built in France, is expected to go into operation in 2025. The cost of the ITER is estimated at $22-50 billion. Through June 2015, $14 billion had been invested in it. Following registration of the CFR patent by Lockheed Martin, Dr. McGuire was interviewed on “The War Zone” website. He explained that the toroidal geometry implemented in a Tokamak device limits the intensity of the magnetic pressure that can be applied to D-T plasma. The analogy would be bicycle tires that burst when overinflated. Lockheed Martin’s breakthrough stems from its device’s much more complicated geometry. It consists of a plasma cell and superconducting magnetic fields applied to the plasma, which enables a very high process efficiency. As McGuire put it, “Instead of a bike tire expanding into the air, we have something more like a tube that expands into an ever-stronger wall.” He added that the system is regulated by a self-tuning feedback mechanism whereby the farther out the plasma goes, the stronger the magnetic field pushes back to contain it. As of yet, there is no published information on the economic aspects of the CFR: the amount Lockheed Martin invested in the project, the assessed price of the different CFR models, or their operating costs. However, based on the information the company has released, it seems the amounts are quite low. •it can accelerate the development of space flights to great distances. •it will be possible to put a CFR on a drone to enable it to stay aloft and patrol indefinitely. If Lockheed Martin’s hopes about its CFR are realized, the fear of catastrophic global energy depletion will become a thing of the past, and mankind will enjoy an environment without energy pollution. williatw wrote: This design has since been superseded with a model using only two main cusps. No image at the linked page of the new design. 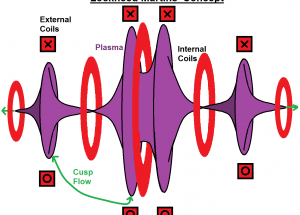 I wonder if it resembles the peanut plasma configuration I came up with while we were speculating on the design. hanelyp wrote: No image at the linked page of the new design. I wonder if it resembles the peanut plasma configuration I came up with while we were speculating on the design. You or anyone else who cares to comment think this is on the level? I know it is the Lockheed Skunk Works (I think) but this seems to good to be true. Doesn't Deuterium/Tritium Fusion produce copious amounts of neutrons? Therefore requiring a fair amount of shielding in order to make it safe; doesn't seem like that quite jibs with the "Compact" part of their proposed CFR. It concerns me that they don't seem to understand the difference between the words "can" and "could". And to answer the D/T question, yes, it is a very hot chain with significant activation, embrittlement, and flux concerns. I also have to wonder about patent overlap with Polywell. Afterall, it seems to me that there is significant prior art in the concept of pinched cusps, be they line or point. Earlier LM presentations addressed the limited lifetime of compact military use. The plan was a drop in power unit that could be refurbished. Gas turbine engines also have cycle lifetimes and are high maintenance. Utility power units would be built differently. But Polywell is a poorly funded (if that) red headed stepchild. No one mentions it anymore. Even LPP is better funded from what I can tell. The T4B can produce one megawatt of energy. The second prototype, the TX, is 18 meters long, seven meters in diameter, and about 2,000 tons in weight. The TX can produce 200 megawatts of energy. Where do these energy numbers come from, exactly? Anybody know? Are they really that far along that they can claim MWs measured net power with a straight face? Found the quote... How did I miss that? It seems Lockheed has a real prototype??? Am I reading that right? No big announcement? But nothing about p-B11 aneutronic fusion? Last edited by paperburn1 on Wed Aug 01, 2018 3:06 am, edited 1 time in total. I believe these are proposed prototypes, not built and tested prototypes. I think this is old news to keep the project interest up. the article posted was published 28 july 2018 Two CFR prototypes were introduced by Lockheed Martin on December 25, 2017. The first is the T4B, which is two meters long, one meter in diameter, and about 20 tons in weight. The T4B can produce one megawatt of energy. The second prototype, the TX, is 18 meters long, seven meters in diameter, and about 2,000 tons in weight. The TX can produce 200 megawatts of energy. However, Lockheed Martin believes the TX’s weight can be reduced to 200 tons. they make is sound like they have the brass ring. ladajo wrote: It concerns me that they don't seem to understand the difference between the words "can" and "could". Also LM was consulted and lent equipment to polywell, no virgin engineer claims that way. Like I said, a rehash. No announcement... Like 'breakthrough Fusion' splashed in the news. Just a new publication of old stuff. 'Did' vs 'Could' vs 'Wished We Did'. I think the consulting went the other way. What exactly is going on in regards with the LM fusion reactor stories? I do not think it is all plain sailing. This story "Lockheed Compact Reactor design is 100 times worse than initial claims", just appeared in NextBigFuture. It is all talking about old news with no real updates, no data, results. NBF is rehashing an old story. New date means nothing.